It is proved that a swim with dolphins is one of the activities that most people want to do at least once in their lifetime and it is totally understandable, being up close to the most intelligent animal of the ocean is something unique. In order for you to live this experience, read on to find out which are the best places to swim with dolphins in Mexico. This moment really needs to be special, so consider all the variables: the weather, the type of interaction, the dolphin habitat or which is the best place to swim with dolphins. Here are 3 incredible natural habitats we highly recommend. Puerto Morelos is only 33 km away from Cancun, it has a quiet beach that offers all the beauty of the Mexican Caribbean. This is a great place to relax on the beach or do aquatic and eco-touristic activities, through which you can come in contact with reefs and corals. If this weren’t enough, this beach has one of the best places to swim with dolphins in Mexico: a completely natural habitat to come in contact with dolphins’ environment and where you can choose from 5 different types of interactions: Dolphin Ride, Couples, The One, Primax 4 or Splash. The Riviera Maya extends down the oriental side of the Yucatan Peninsula and is characterized by its Caribbean shores of fine, white sand, very appreciated by national and international tourists. This is another excellent place to swim with dolphins because, like in Puerto Morelos, there is a completely natural habitat. Extending over 10 thousand meters, this space is surrounded by the Caribbean Ocean and is designed for you to experiment a unique moment of coexistence with the dolphins. 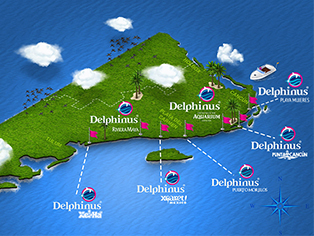 Visit this habitat and make your dream a reality: swim with dolphins in the Riviera Maya. Xcaret is described as one of the most beautiful and fun places in the Riviera Maya. It is also very well known for its natural environment that houses dolphins and, in recent years, has become one of the best places to swim with dolphins in Mexico. Here, children also have the opportunity to live this experience that a lot of adults dream about. The work and commitment of Xcaret to the environment goes beyond giving its visitors the opportunity to swim with dolphins: their facilities have the most successful dolphin breeding program. In charge are veterinarians, marine biologists and Specialists in Animal Care who monitor the mothers and their calf day and night. This is the moment you’ve been waiting for, make your dream come true. Swim with dolphins in the habitat you like the most and share this experience with the people you love most. Let us know, which one is your favorite?